The Crete of Martin Kušej’s new Idomeneo is unconfined by national or chronological boundaries, though the setting of the first two acts in particular bore claustrophobic intimations of the landlocked autocracies of Mozart’s Austria, Soviet-controlled republics behind the Iron Curtain, and parts of Russia today. Gun-toting heavies herded the imprisoned Trojan chorus, who cut an unhappy crew throughout the evening, both in character and in their singing. The orchestra of the Royal Opera likewise sounded at sea with the sprung French rhythms of Marc Minkowski’s conducting. Stage and pit were often at variance with each other on the night I attended, though they snapped together to heart-stopping effect in the awe-struck C minor tread of ‘O voto tremendo’, in the wake of Idomeneo’s stated determination to kill his son Idamante. This was one of many miraculous moments in the act where the opera came into focus as the missing link between high Gluck and mature Verdi, in this case via the Funeral March of Beethoven’s ‘Eroica’. Indeed, with its tropes of an unhappy father-ruler and his uneasy relationships with a weak, rebellious son, pure, putative daughter-in-law and insurgent chorus, one can only wonder if and how Idomeneo was unknown to later master of political opera. The great strength of the time- and shape-shifting work done by Kušej and Minkowski was its situation of Idomeneo within a dramatic continuum. From her first entry Elettra (Malin Byström) was recognisable both as the hopelessly damaged survivor from the carnage at the House of Atreus, and as Giovanni’s Donna Elvira in nuce. In her opening aria she strokes the faces of the children she cannot bear, who by the end form a Boko Haram-like band of militants. Kušej illustrates his explicit slogan of protest, that revolutions may come and go but the rulers stay the same, with an abbreviated version of the opera’s final ballet accompanying tableaux vivants on a turntable like the A and B sides of an 80s rock album, to which the High Priest (Krystian Adam) and his goth-glam minions had posed for the cover image behind the king’s abortive murder of his son. 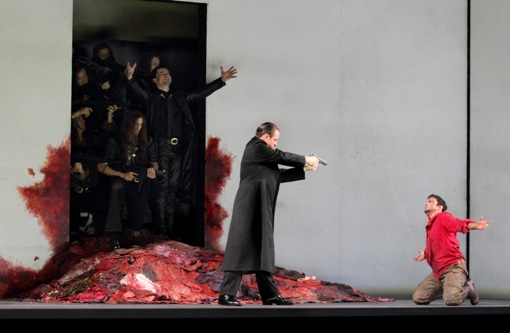 With Idomeneo (Matthew Polenzani) left to sing his last aria to himself, bestowing peace on precisely no one, now we see Idamante and Ilia installed in power; now we see them with the mob which keeps them there. The suggestion is made that music has its own part to play in this theatre of complicity. Who took the decision in 1781 to adapt the French source of Idomeneo’s text and graft on a happy ending, Mozart, his librettist Varesco or their paymasters in Munich? We may not know but the question is worth asking. More space for us to consider such questions for ourselves would have been welcome, but the printed ‘production synopsis’ and assorted stage directions were tiresomely didactic. Having left offstage the monster that ravages Crete in Act 2, Kušej and his dramaturg had no need to label it an insurrection. Less telling, more showing: for my delighted companion, the king’s adviser Arbace (Stanislas de Barbeyrac) was the man he sees each day at the foot of Angel tube station’s escalators; to me, he bore elements of Tiresias, Seneca, the hurdy-gurdy man and the yurodivy, men who feel free to speak truth and lies to those in authority, secure in their private scorn for any earthly power. Despite losing two of his three arias, he was a central character with a story of his own; so too the even briefer role of the High Priest, styled here as a Beria-like head of the secret police, manipulating religious practice for political gain in ways recognisable not only to us today but to the Enlightenment artists such as Mozart, da Ponte and their contemporaries, most of whom had brokered their own uncomfortable truces with their consciences and the need to bend the knee to aristocratic and ecclesiastical patronage. In its sophisticated sense of history, therefore, the staging hardly deserves the controversial and lazily applied tag of Regietheater which has gained it some notoriety. People sing to each other and act the words they’re singing, some better than others. 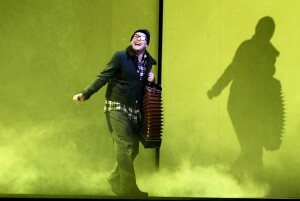 The opera’s dual heritage in both opera seria and tragedie lyrique is realised not only through Minkowski’s direction, or the kind of active continuo part we more often hear in Rameau than Mozart, but in the mises-en-scène which embody the ways that characters spend less time listening and responding to each other than telling or confessing: to others, to themselves, to God. With her every entrance, Sophie Bevan as Ilia focused the action, her diction as sharp as her voice was voluptuous, both enticing and resisting Idomeneo’s more-than-fatherly affection, her presence demanding a response from everyone around her, a magnetic pole for the Act 3 quartet in which Mozart throws off the conventions of his chosen genres to spike each actor on the horns of their own dilemma. Original in both senses of the word was the brave decision to cast a male soprano as Idamante, and Mozart’s audience was surely more familiar with Franco Fagioli’s voice-type than we are now, though the castrati of his day likely projected a keener sense of the text. There are three performances left in the run, and not many tickets. Here’s hoping for a revival. Posted on November 11, 2014 by Peter Quantrill	This entry was tagged Bevan, Idomeneo, Kusej, Minkowski, Mozart, Quantrill. Bookmark the permalink.